Crime fighters unite! Now you can vacation like your favorite super hero in Global Caravan’s Carbon Fiber CR-1. This sleek ultra luxury RV is definitely what Batman or Ironman would use on vacation. Just take a peek at this awesome machine! It’s a 35 foot bumper pull trailer that stands out from the pack. 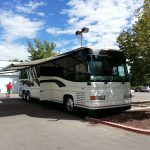 This lightweight RV offers everything a five star penthouse suite is known for. It comes complete with a lounge, full kitchen, big screen tv, smartphone system controls, large master bath, and a solar power system. This sleek machine will turn heads wherever you roll. The cost? A mere $170,000. But hey, Bruce Wayne can afford that!